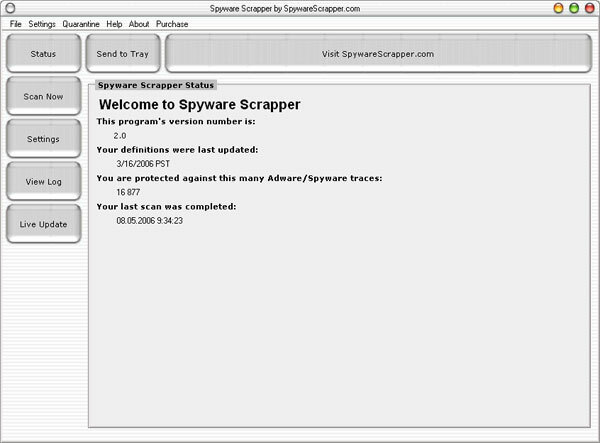 Spyware Scrapper does not use false positives, provides updates and really finds some spyware-related objects. Nevertheless, we DO NOT recommend purchasing and using this product. The program uses ineffective malware detection engine. Although it actually identifies some installed malware and tracking web browser cookies, it bypasses all the files, folders and other parasite-specific malicious objects, which signatures are not included in its spyware definitions database. In other words, Spyware Scrapper can detect only well-known, relatively old parasites, but not their recent variants, widely spread threats or new, emerging pests. System scan performed on a regular modern computer containing hundreds of gigabytes of data does not take more than 30 seconds. As you know, there are no such spyware remover capabable to thoroughly check the system so quickly. Furthermore, the program does not provide any additional information on identified threats – only their names. Take a look on one of the screenshots provided below. The program’s demo version refuses to remove any malware it finds. It asks to register and purchase the full product. 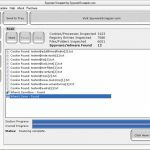 Spyware Scrapper is the same program as theSpywareShield, Spy Reaper Pro, Privacy Crusader, SpyShield, Ad-Purge Spyware Remover, SpyViper and Froggie Scan. All these rogue products use the same spyware definitions database, produce similar scan results and have almost identical user interfaces. Furthermore, all of them consist of terribly similar components. The official web site is www.spywarescrapper.com. This entry was posted on 2006-05-08 at 02:12 and is filed under Corrupt Anti-Spyware, Software.